Worker Robert Chilson installs LED lighting at The Philadelphia Museum of Art last month. The Philadelphia Museum of Art has reopened its Chinese galleries to literally glowing reviews after 10 months of renovations, during which a new LED lighting system was installed, among other improvements. Visitors can now better appreciate the colorful painted details on lacquered cabinets and vivid expressions on porcelain figures. Artifacts that were covered in grime at one point now gleam under the new lights, thanks to the work of a large team of conservators who worked around the clock to make sure the 7,000 objects in the museum’s collection were ready for their closeups. The ceramic vases and carved wooden armchairs in the Chinese galleries aren’t the only items visitors will be seeing in a new light. The LED lighting system in the Chinese galleries is part of a much larger project: The Art Museum plans to replace the 11,000 lightbulbs and fixtures in its main building, Perelman annex, and Rodin Museum with LED bulbs and fixtures. LED lighting now showcases the antiquities in the Art Museum's Chinese galleries. That includes the American Art galleries, the Modern and Contemporary galleries, and new spaces that are part of the museum’s ongoing renovations, among them the new restaurant. 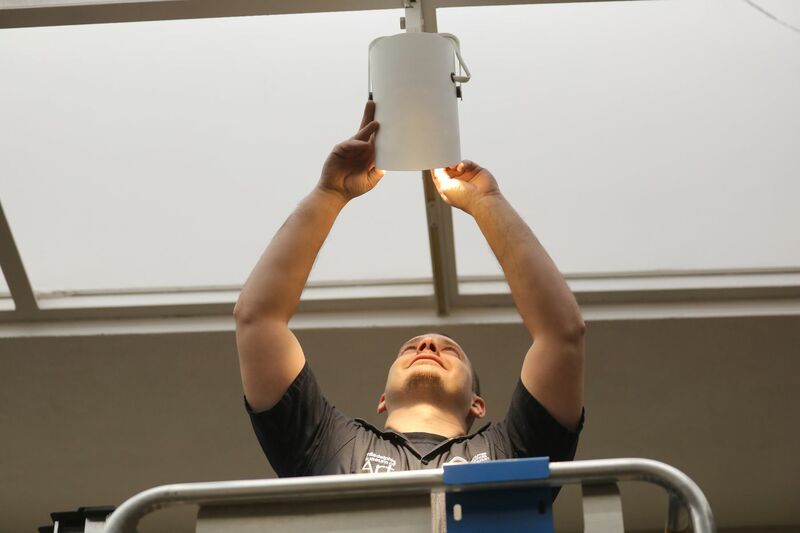 The museum is joining many other art museums of its caliber around the world, such as the Whitney Museum of American Art in New York, the Museum of Fine Arts in Boston, and the Barnes Foundation in Philadelphia, looking to increase LED use and move away from incandescent lighting to conserve energy. The Penn Museum and the Academy of Natural Sciences of Drexel University are also starting the transition. A new trend is to blend LED lighting with natural light to give viewers the best experience possible. The Philadelphia Museum of Art’s efforts will be the biggest overhaul in favor of LED lighting in a Philadelphia museum to date. New LED museum lighting, in closeup. The new lighting is part of an $11.3 million energy-conservation upgrade at the museum funded by the City of Philadelphia’s Office of Sustainability, the Philadelphia Energy Authority, and Johnson Controls as part of the city’s energy master plan developed in 2017. The city owns the museum building and pays an average of $3 million a year to heat, light, and cool the space. The energy conservation effort is expected to cut costs by 24 percent annually. Until now, the museum’s lighting has been largely incandescent and fluorescent. Incandescent bulbs are lighted by running an electric current through a metallic filament, which wastes a lot of energy as heat. Fluorescent bulbs, which emit less heat and are therefore more efficient, are lighted by exciting a gas, usually a mixture of argon and mercury vapor, with a current, causing it to glow. LED lights are the most efficient of all. They produce a flow of electrons through a semiconductor, generating light directly without heating metal or gas. LED lighting at Stir, the new Art Museum restaurant. They are particularly well-suited to museums because, unlike traditional light sources, heat is not projected forward with the beam of light, so fragile items are affected less. LEDs also last 25 times longer than traditional lightbulbs, so museums can go a decade or more without having to replace them, according to Jason Rainone, lighting designer at the Penn Museum, where the newly reopened Middle East Galleries feature LED lighting. Though lighting is not something most visitors think about at the Art Museum, the way an artwork is lighted shapes their experience with it. Tasteful spotlighting and washes of color can draw the eye to certain works in a room crowded with them and highlight details; dim lighting in the wrong color can give a painting a green tint. Jennifer Sontchi, director of exhibits and public spaces at the Academy of Natural Sciences, said that museum is looking to slowly transition to an all-LED lighting system in the near future. The Barnes Foundation is also looking to make the transition, said Deidre Maher, director of communications there. The Barnes already uses an intelligent lighting system that allows the museum to control the balance in its galleries between artificial and natural light. The Philadelphia Museum of Art’s South Asia galleries reopened in 2016 with a combination of LED, halogen, and fluorescent lighting after 19 months of renovations, significantly improving the presentation of one of the museum’s signature works of art — the 16th-century Indian Temple Hall, the only such structure standing outside India. One space in the Art Museum that will drastically change after the lighting upgrades have been made is the west entrance, which is currently illuminated by three downlights in the ceiling. Rub said he expects the addition of LED lights in 2020 to provide the room with a much richer and clearer illumination, making it more welcoming to visitors.